A paycheck shouldn’t be the only benefit of working for you. It’s not cheap to find, train, acclimate and continuously improve the performance of your employees. So when you find good people, it makes good sense to give them reasons to want to stay with your company. 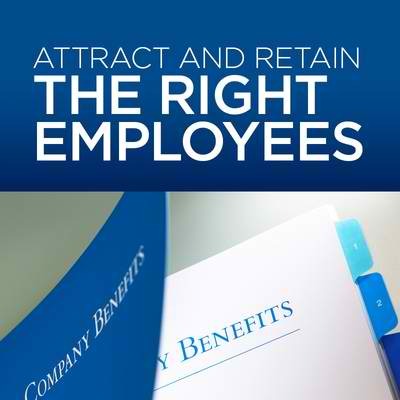 Employee benefits have been a powerful way to retain employees since they were first widely adopted in the 1950s. Today, people have come to expect some level of health coverage and retirement saving plan for most jobs. Your challenge is crafting an attractive plan that won’t break the bank. Healthcare is on everyone’s mind. With the ever-changing healthcare landscape, a solid health plan is a great way to add value for your employees. They can have the security of knowing their families are safe from escalating healthcare costs and can get the treatment they need if a catastrophic illness occurs. Today, there is a wide variety of health programs available to fit the needs and budgets of you and your employees. Whatever plan you choose, it can act like the glue you need to keep valuable employees sticking around. Retirement plans that cost you nothing. You only need to watch television or listen to the radio to hear the importance of retirement planning – it’s in commercial after commercial. You can help employees feel better about their future security with a 401 (k) plan. Whether or not you choose to contribute to the plan, you are giving employees a valuable way to save for the future and reduce their taxes today. That’s a powerful 1, 2 punch. Put together a plan and communicate the value. All too often, employees don’t understand the total value of the benefits their employers provide. Your benefits professional should help you communicate the value of the plans you choose, so employees realize the investment you are making for them and the consequences of what they lose should they decide to go elsewhere.